This data logger monitors voltage from 0 to 2.5V DC and can be connected to a variety of sensors enabling the logging of a wide range of processes. The logger's design makes it ideal for discreet indoor monitoring in a variety of buildings. It sends information via USB or LAN receiver to the computer managing the system. This unit is supplied with an input lead. (CAB-3239). Alternatively you can buy our 5-pin connector plug (ACS-9703) to connect to your own probe/sensor. 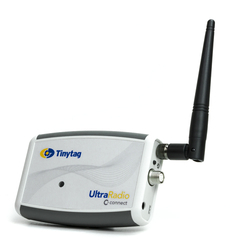 Radio data loggers operate using wireless connectivity and require a receiver and a copy of the Tinytag Explorer Connect software to function. Radio loggers can be mixed and matched with Tinytag Plus LAN Ethernet data loggers within an application to meet particular site layout and infrastructure requirements. Please note: this product is only for sale in the EU and Australia. 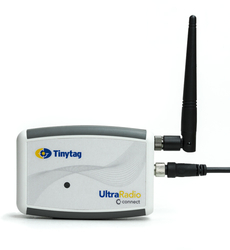 Tinytag Connect is a central data management feature for Radio and LAN loggers giving users on a network remote access to data being recorded. Data is presented in the Tinytag Explorer Connect software: a viewing pane presents a global view of the monitoring application: information from multiple points can be easily accessed by any permitted user on a LAN, or over the internet by setting up VPN access to the computer running the system. Connect functionality enables multiple loggers to be configured and downloaded simultaneously, and they record locally in the event of communications problems ensuring no data is lost. Alarm warnings, either audible or sent via email enable corrective action to be initiated. Technical support information including FAQs, manuals and documentation for this data logger.